The winner of the Bailey Women's Prize for fiction is Irish author Eimear McBride with her astonishing debut, A Girl is a Half-Formed Thing. To read A Girl Is a Half-formed Thing is to plunge inside its narrator’s head, experiencing her world first-hand. This isn’t always comfortable - but it is always a revelation. Touching on everything from family violence to sexuality and the personal struggle to remain intact in times of intense trauma, McBride writes with singular intensity, acute sensitivity and mordant wit. 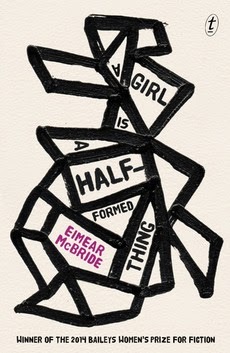 A Girl Is a Half-formed Thing is moving, funny – and alarming. It is a book you will never forget. Request a copy from the Library. The BAILEYS Women’s Prize for Fiction is awarded for the best novel of the year written by a woman of any nationality in the English language. Established in 1996, the prize was set up to celebrate excellence, originality and accessibility in writing by women throughout the world.